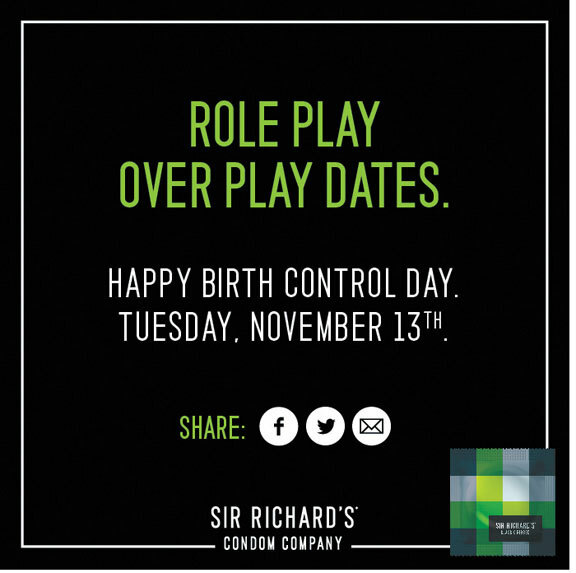 Happy Birth Control Day. Your likeness, carved in butter. Let's launch! There is a two-man parade happening in one town to celebrate the arrival of DISHNET high speed Internet to an area hard-pressed for fast Internet service. Two men are so giddy to have high speed Internet that they create a bare bones parade, with one man twirling a stick and the other a child’s green umbrella. Their parade may be small, but not for long. See it here. A 15-second spot shows the parade coordinator throwing candy to residents and regaling them with information on how they, too, can have fast Internet. Residents are not enthused and throw the candy back at him. Watch it here. Barton F Graf 9000 created the campaign. Does your commute resemble the one depicted in a TV ad for PlayStation Vita? “Train” shows a crowded subway car, where people are packed like sardines. One commuter stands out, given her wartime attire. Turns out, the woman is an assassin, hunting her prey. And, in an area where technology tends to fail its users, the PS Vita can be played underground, turning a boring commute into one where Assassin’s Creed 3 can easily be played. See the ad here, created by Deutsch LA and directed by Dante Ariola. The Belgian Natural Gas Association launched a TV spot illustrating how natural gas and solar energy complement one another. The sun’s natural energy is portrayed as strands of yarn, growing grass, flowers, protecting trees, homes and interior pipes. When clouds cover the sun, natural gas kicks in to cover and warm the remainder of the house. See the spot here, created by TBWA Belgium, directed by Olivier Babinet and produced by Lovo Films. Walter and The Awful Pawfuls, a rock band of cats, are back with another music video extolling the Litter Genie. In “I Haz A Pie Row Tek Nic,” the band wows their feline audience with pyrotechnics, spikes, and plenty of heavy metal hair, sending fans running up the walls. Really. Watch the video here, created by JWT. I love Joan Rivers and Mario Cantone. Together, the duo stars in the latest Old Navy ad for its collection of little bold dresses. The little black dress has been replaced with colorful solid and striped dresses. At a fashion show, even harsh critics like Rivers and Cantone can’t help but love the pop of color. See it here, created by CP+B. Mark your calendars: Nov.13 is Birth Control Day, a holiday celebrating “the responsible decision of choosing not to be a parent,” according to its homepage. 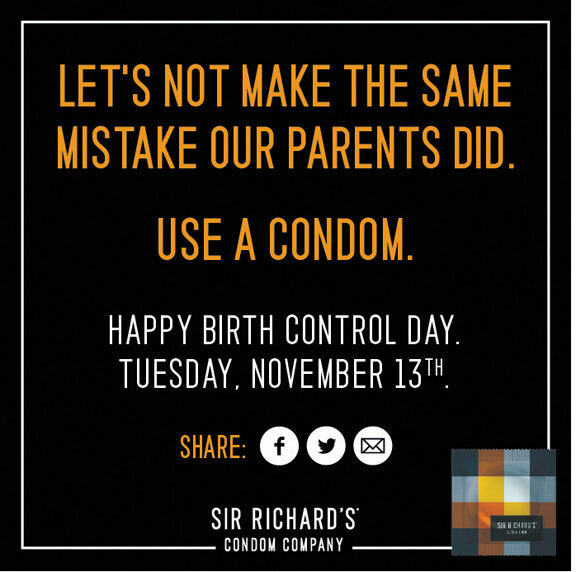 Sir Richard’s Condoms created the new holiday and is promoting it with an online and social media campaign, created by TDA_Boulder. Site visitors can send 12 different “Happy Birth Control Day” cards to loved ones, via Facebook, Twitter, Pinterest or email. Sample messages include “Let’s not make the same mistake our parents did,” “I’d rather not remember we slept together in 9 months,” “I’m afraid our baby would turn out like you” and “Let’s change positions, not diapers.” See them here, here, here and here. Nov. 13 is the date in 1921 when Margaret Sanger was arrested for trying to keep the New York City Police from closing down the nation’s first American Birth Control Conference. Yum. Carl's Jr. launched a TV spot promoting its made-from-scratch breakfast biscuits and the woman who makes them each morning. Some employees have many tasks to handle on a daily basis, but this woman, dubbed a one-trick pony, has a singular role: to make piping hot, delicious biscuits. Watch it here, created by 72andSunny LA. Darigold, a dairy company owned by farmers, launched a “Farmalicious” campaign targeting residents living in the Northwest. The first campaign element is the “Better Butter” contest where participants must say, “Better Butter Better,” five times fast, and submit their video online. The winner gets a bust of himself or herself carved out of butter by Linda Christensen, a butter sculptor who has created 500 butter busts. Amazing. The contest winner will also be featured on a billboard for the campaign. 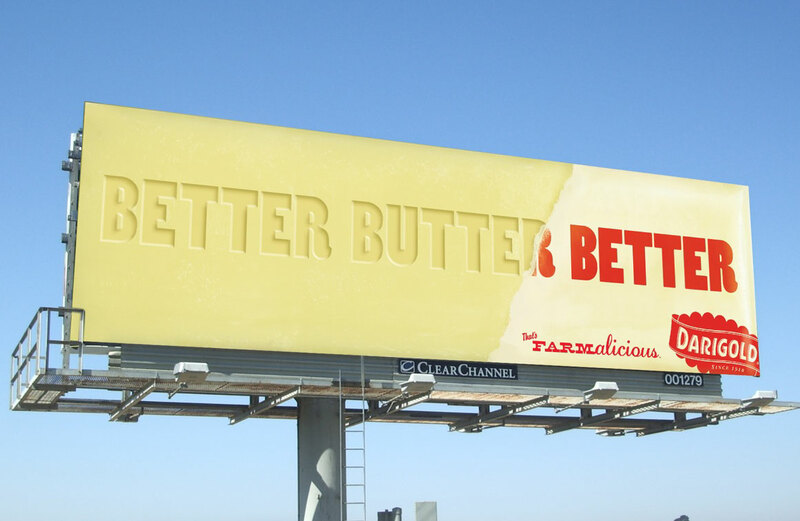 Here’s a teaser billboard that resembles a giant stick of butter. Wexley School for Girls created the campaign. Random iPhone App of the week: I’m a sucker for scary movies and B-Reel created an impressive app to promote “House at the End of the Street,” starring Jennifer Lawrence and Elisabeth Shue. Upon moving to a new town, the pair find out the house next door was the site where a young daughter murdered her parents. Players must escape a crazed killer who traps them in a dark basement. Users must tap, shake, rotate or shout into their iPhone in order to survive. Much like the movies, any loud noises or sudden movements can draw unwanted attention, so players must silently make their way up the basement stairs or be recaptured. The app uses different sensors and gyroscopes that know which direction you want to go and how you react to each situation by implementing sounds of police sirens, heavy breathing, footsteps, echoes and sudden bangs. The app is free in the App Store.